Home >>Speeds and feeds >>A few tips on surface milling with ballnose endmills. A few tips on surface milling with ballnose endmills. Since surface milling is more than half of what i do for a living, I decided to share some of my tips on that topic. Generally you want to create a continuous toolpath that does not change directions too often. 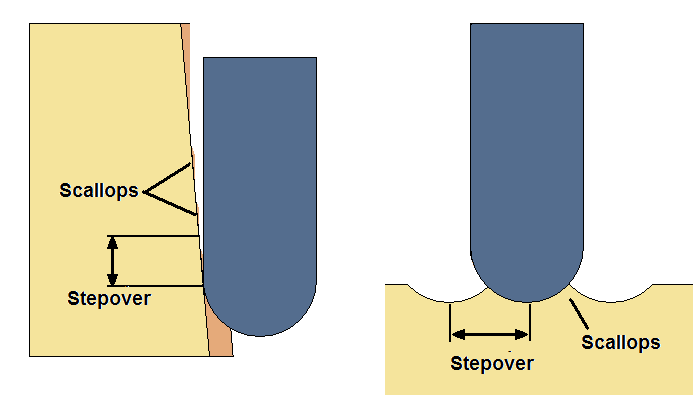 Changing directions slows the machine down and reduction in feedrate affects deflection of the cutter. Different deflection means you get gouge marks on your surfaces. When you have a long narrow piece its better to go along the long side to save on time and machine wear. When milling cavities you need to first rough, then semi-finish then finish. Leave 15 thou after roughing, 3 thou after semi-finishing and finish to zero. All with progressively smaller tools. 3-5 thou chiploads are very common for surface finishing. Ball mill will always give bad finish on shallow areas- the center is not cutting, but dragging around. Also straight portion of the flute acts as a wiper and reduces scallop that the ball portion creates. This is why going from top to bottom is safer and yields better surface finish. The closer the wall taper angle to the taper of the flutes the better finish you will get. There is another reason for always trying to go from top to bottom. When taking material top to bottom you engage stock closer to the tip of the tool. It makes cut more stable. It is more safe because you are less likely to bury the tool in stock unexpectedly. Do not go from climb milling to conventional UNLESS you need to save some rapid time. Pick up only climb milling and you are good to go. Changing from climb to conventional will cause tool to deflect away from the work on climb and into the work during conventional pass. You will see zebra marks all over your surfaces. New Comment to: A few tips on surface milling with ballnose endmills.